THE government has been urged to stamp out a sneaky trick in power bills that costs Aussie households hundreds each year. 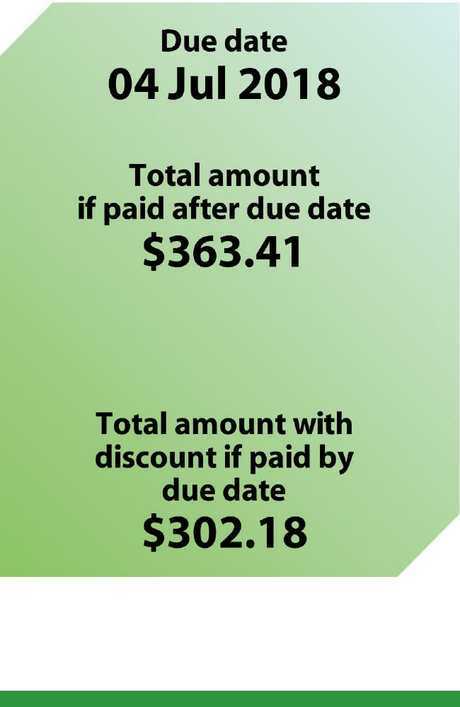 The Australian Competition and Consumer Commission has taken aim at electricity retailers who have quietly turned incentives that encourage customers to pay on time into costly punishments for those who pay late. A damning report released today by the consumer watchdog slams the tactic whereby energy providers charge steep late fees on bills under the guise of providing a discount for paying on time. These late fees can add as much as $60 to an average bill. It sounds like a good deal, until you get stung. The ACCC argues that gouging of Australian households and businesses by major power companies has reached an "unacceptable" level and has outlined measures that would save an average household $409 a year. The sweeping report into the national energy market recommends a complete "reset" of the market, accusing power companies of hitting customers with unnecessary costs. The ACCC said Australians were losing "hundreds of dollars a year" in unfair costs through market manipulation and misleading practices by energy providers. The sweeping review was commissioned by Treasurer Scott Morrison in March last year as the Turnbull Government scrambled to rein in the rising cost of power. The report contains 56 recommendations for the government and argues that major reforms are needed to bring down prices and restore consumer confidence. Energy Minister Josh Frydenberg labelled the report as "an extremely comprehensive and important piece of work". • The introduction of default offers consistent across all retailers, set at a price determined by the Australian Energy Regulator. The report also said there was a case for the government to underpin long-term contracts that bring new dispatchable power generation - either baseload coal or gas - from operators that do not have a large market share. The inquiry also suggests there should be a cap on any further mergers or acquisitions by a company with more than 20 per cent market share, however building new power generation facilities would be allowed. 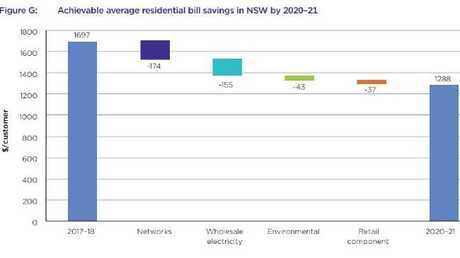 The inquiry believes if the ACCC's recommendations are adopted, an average residential customer in NSW should be able to achieve savings of $409 on annual power bills by 2020-21, which represents a 24 per cent saving. Commercial and industrial customers, who are the heaviest energy users, could see electricity costs decrease on average by 26 per cent. Power bills could reduced by a quarter of the cost in the right changes are made. "There is good news for consumers out of these recommendations, which the ACCC has said will reset the market and drive power prices lower," Mr Frydenberg told Sky News this morning. 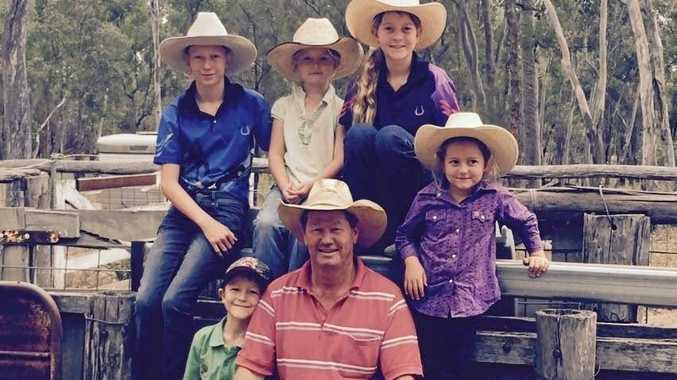 "There are 56 recommendations and the Turnbull Government will carefully consider them and we will consult with the states because a number of the recommendations have an impact on state responsibilities," he said. The ACCC's report was supportive of the government's National Energy Guarantee plan but warned it could be hampered by what it described as a broken market. "The National Electricity Market is largely broken and needs to be reset. 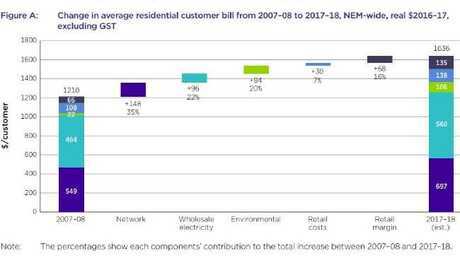 Previous approaches to policy, regulatory design and competition in this sector over at least the past decade have resulted in a serious electricity affordability problem for consumers and businesses," ACCC chairman Rod Sims said. "It is clear that most households are paying far too much for electricity." The report noted small changes made recently to address the problem of high prices that are a step in the right direction. There have been some small retail price decreases announced by retailers in June 2018, it pointed out. Additionally, network tariffs are generally flat or trending downward, albeit in an historically low cost-of-capital environment, the ACCC said. Last year Malcolm Turnbull summoned big energy retailers including Energy Australia, Origin Energy, AGL, Snowy Hydro, Momentum Energy to Canberra demanding they be more transparent and give customers the information they need to reduce power costs and compare the market. "These improvements are a step in the right direction, however much more needs to be done," the report said. The inquiry began by identifying the root causes of high electricity prices across the entire electricity supply chain. The inquiry began by identifying the root causes of high electricity prices across the entire electricity supply chain to see where changes could be made. "While important steps have been taken recently, restoring electricity affordability will require wide ranging and comprehensive action. We believe our changes can and will, if adopted, have a powerful and tangible impact on electricity affordability for all Australian," Mr Sims said. He warned that despite the poor decisions made in the past, it was up to the federal and state governments to make the tough decisions to reshape the market. Included in that was for voluntary writedowns of network over investment, including by the NSW, Queensland and Tasmanian governments. It also suggested restructuring of Queensland generators into three separately owned portfolios to improve competition. "Our recommendations require some difficult decisions as sound economic reform usually does," Mr Sims said. "We must move away from narrowly focused debates; addressing affordability requires change across a broad front."